UMASH staff participated in celebrating 100 years of research and outreach activities of the University of Minnesota at the Southern Research and Outreach Center in Waseca, MN on September 19, 2013. 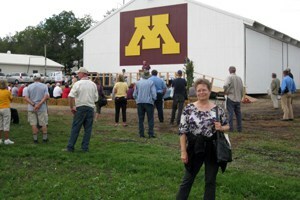 Formerly known as the Southeast Demonstration Farm and Experiment Station, the Waseca facilities have been the birthplace of many new technologies and innovative production practices that have affected agriculture not only in Minnesota but around the world. The birthday celebration that drew a big crowd included informational displays, door prizes, and a free picnic supper meal. The SROC is a good place to visit anytime to learn more about what is new in the field.